The Healthy Hoff: Makin' Oat Flour! A few times this past year, courtesy of my CSA, I received pounds of organic rolled Oats - grown right in Ohio and harvested by horse drawn reapers (no clue what that means). In reality, I couldn't stand them. Try as I might, I'm addicted to my tried & true Quaker Oats and scowled each time I received a new bag. That was until I discovered...Oat Flour! Got Oats? Got a Vitamix? 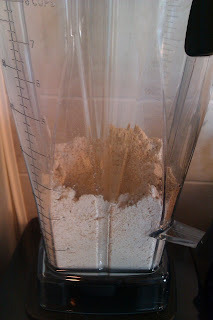 Then you got the makings for Oat Flour! My2Cents: No, quick oats won't work. Yes, you can make this in a regular blender or food processor - probably need to pulse instead of blend. Now what? Use as a straight up substitution for Whole Wheat Flour or Whole Wheat Pastry Flour. Makes baked goods moister, chewier, and crumblier. Great for making bread - infuses a nice, nutty flavor, but I recommend using half Oat & half WW Flour/Bread Flour. While Oats are gluten-free, cross-contamination in the field or manufacturing plant can corrupt them for you sensitive types. If you ever want to see a horse drawn reaper, without making the drive to Amish Country, you can go to the West Side Market during harvest season. In the lot behind the apartment building and to the left (if you're facing the front) of the market is the lot the city bought for farming. When they gave out plots, an Amish group got on. You'll see them out there using their horse-powered machinery. Another group to get a plot there is the Bhutanese refugee group. I didn't know Cleveland has a large group of refugees from Bhutan, but I'm glad they ended up here. You can get some really cool veggies that I've never seen in any other farmers market/store/csa. Kinda cool ! Heather - that is so cool! Now that the West Side Market has re-opened, I am definitely going to check that out. Thanks for sharing! Chocolate Mug Cake Just For You! Valentine Sweets For Your Vegan Sweetie!